You know I am French right? And French love goat cheese and walnuts. It is a combo that French recipe use a lot. 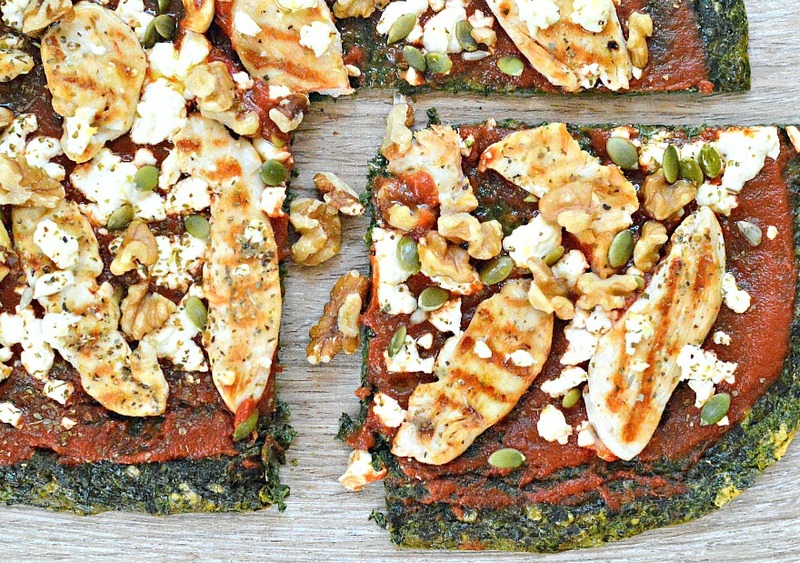 That is why I choose to top my pizza with grilled chicken breast, feta goat cheese, walnuts and extra pumpkin seeds. This flavor reminds my childhood in France. But well, any toppings will do ! Just ue what you have got in your fridge as soon as it i low carb it will make a delicious low carb dinner. This crust is super easy to make. I made it many times in my blender or food processor. Both works very well. I recommend to use pre wash baby spinach or if you are going to wash your spinach leaves make sure you drain them well. I love to pat dry mine between pieces of absorbent paper. You don’t want to add water into the recipe or the mixture will be too runny and it won’t form a crispy pizza crust when baked. At first sight it looks like a baked omelette but it really makes a great pizza. Plus it contains only 2 eggs and lots of spinach which makes this recipe good for your kids too. An easy way to boost their veggie and protein intake. This is how it looks like after baking. I garnished the pizza with home made tomato sauce, grilled chicken breast cooked on the BBQ. The BBQ is never too far away from the kitchen when you live in New Zealand! And I love the taste of BBQ grilled chicken. If you are looking for other low carb spinach recipes you will love my blog! I am such a spinach lover. Another favorite recipe at home are my spinach tacos shells. Oh and yes Emma -my little girl very enjoyed this pizza. I found this recipe easy to eat by kids as the crust stay light and soft. I was very happy to look at her eating the spinach hidden in the crust! 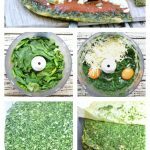 Low Carb Spinach Pizza Crust and easy 3 ingredients recipes made of eggs, spinach, cheese and spices - optional. Keto, vegetarian, gluten free. Line a baking sheet with a piece of parchment paper. Spray some olive oil to avoid the crust to stick to the paper. Set aside. Wash, drain the baby spinach leaves. Make sure you the spinach leaves very well. You can pat dry between piece of absorbent paper or use pre washed baby spinach leaves to avoid this step. 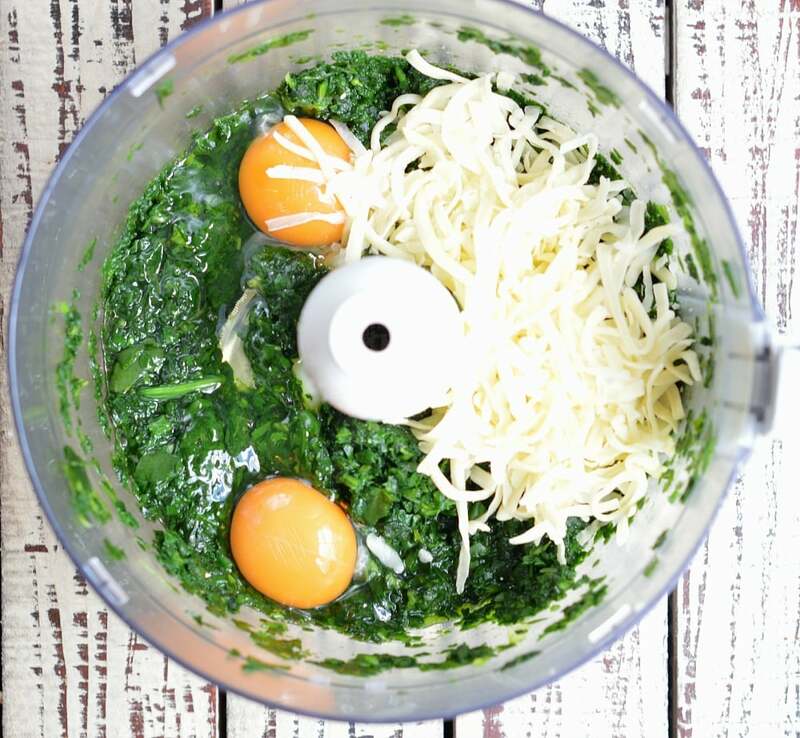 In a blender or food processor, add the baby spinach leaves, cheese, eggs salt and herbs. 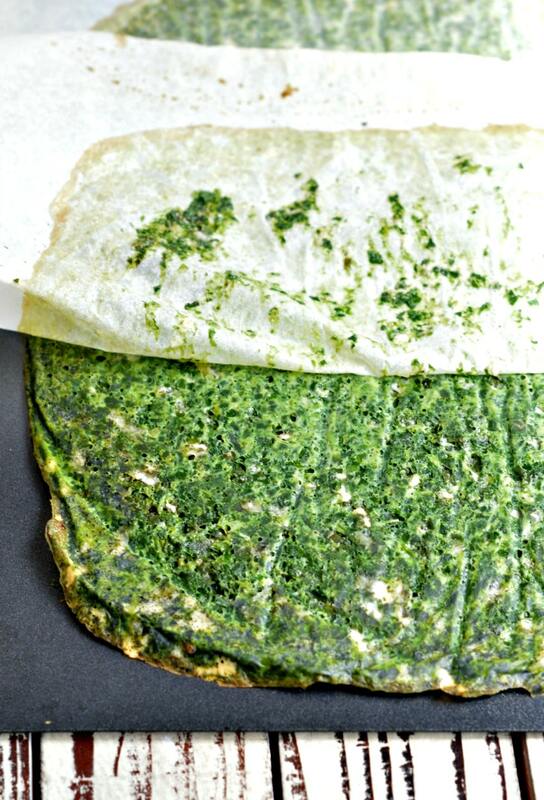 Pour the spinach crust batter onto the prepared baking sheet. Using a spatula spread the batter into a rectangle that cover the whole baking sheet or use two baking sheet and create two round pizza base of 10 inches. 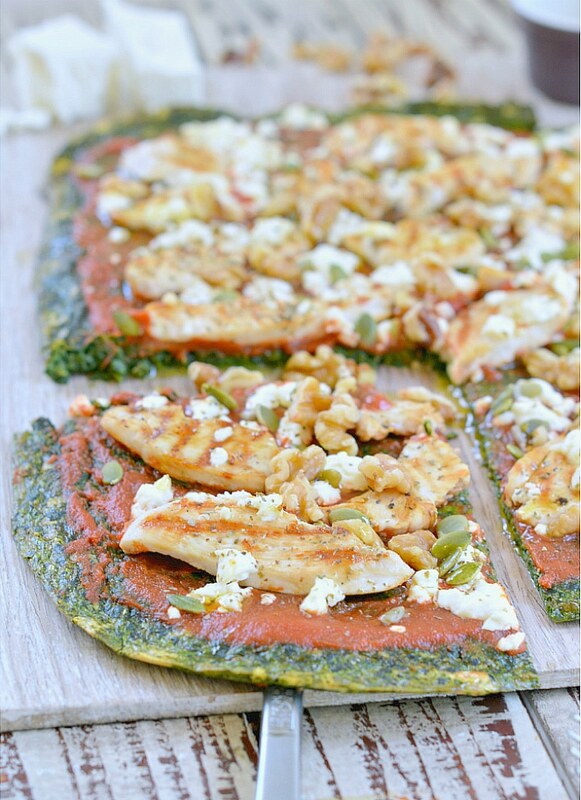 Bake the spinach pizza crust for 15-20 minutes or until the sides are darker and crispy. Remove from the oven and add your favorite low carb toppings like tomato pizza base (use 100% natural tomato passata), diced red capsicum, mushroom slices, extra grated mozzarrella and olives. Serving size: this recipe makes 2 rounds pizza of 10 inches or 1 large rectanlgle pizza. Nutrition panel is for 1 slice of a 10 inch round pizza based on 4 slices per pizza. Freeze: cool down the cooked pizza crust and freeze wrapped in plastic wrap. Bake frozen with your favorite toppings on the day. How big is the pizza and how many would you say this recipe serves? Can I substitute kale for the spinach? I really LOVED this recipe. I’m so excited to be able to join the family on Pizza Fridays again. I used mozzarella instead of edam because that is what I had on hand. I’m considering trying this recipe with arugula. I think my favorite thing about this recipe is that it is sooooooo much easier than the cauliflower crusts recipes I’ve been trying. Hi Wendy, this is so great to read your comment! I am sure any cheese will work well in this recipe. 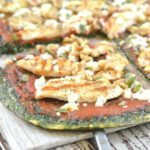 I love low carb pizza too and I agree the spinach pizza crust is much easier than cauliflower! I hope you find other low carb recipe you love on the blog, I have got plenty of dessert too 🙂 see you around. Carine. Hello! 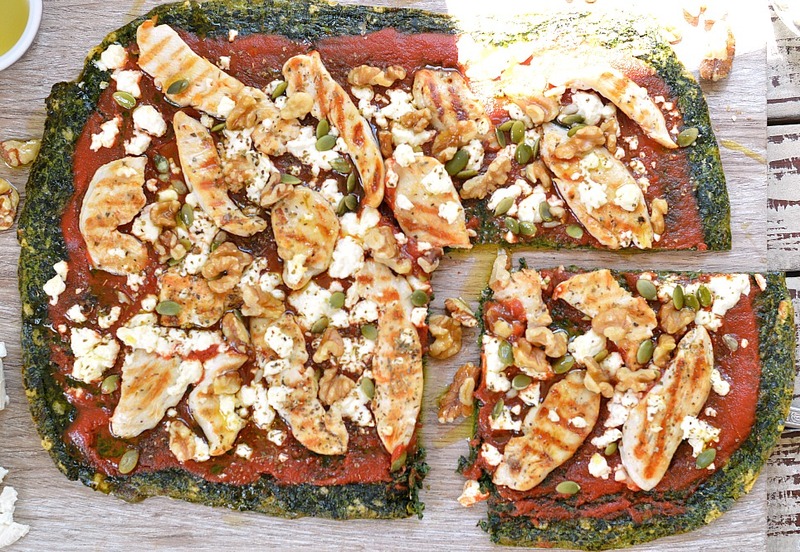 This spinach pizza crust recipe serve 8 slices – 2 round pizza of 10 inch (4 slices per pizza). The net carbs per slice of crust- without toppings- contains 1 g carbs o The full nutrition panel is available after the recipe card. Enjoy the recipe and good luck with your Atkin diet! xoxo Carine. I want to try this recipe as I am hearing all kinds of nightmares about the cauliflower crusts turning out soggy or falling apart. I hate the taste of eggs. I know you need some kind of binder and eggs are high in protein as well so they are the obvious choice. My question is, can you taste the egg, or mostly the spinach and toppings? Thanks so much. Hi Olivia ! there is only 2 eggs in this recipe (for 2 round pizza so 1/4 egg per slice, not much) so it does not taste so much ‘eggy’ to me. I would use more spices and a strong flavor cheese to balance the light egg taste if you are not a fan of eggs. I would recommend grated Parmesan or old cheddar. Don’t skip the garlic powder and maybe enhance with 1/4 teaspoon of onion powder, and more oregano. With all those little twist you are guarentee that this won’t taste like eggs 🙂 Enjoy the recipes on the blog. XOXO Carine. Oh my goodness this is amazing! I can’t get myself to like fathead pizza dough no matter what recipe I try. This is SO GOOD! I’ll never mess with fathead dough again. I did a chicken and bacon blue cheese pizza, the crust not only has great texture but tastes so good! I can’t wait to try more pizza flavors and toppings. Thank you so much for this!! Also, I divided all ingredients in half and made one personal 10 inch pizza. Perfect! I am so happy you love this pizza crust! Thanks for sharing your lovely comment ! Enjoy the keto recipes on the blog. XOXO Carine. What is the weight of 1 cup of spinache? Ik like to make the pizza but I am not used to cups. I am sorry, I don’t measure my ingredients in grams only in cups so I can’t tell. Enjoy the blog! Carine. I do weight-watchers so subbed then normal cheese for protein cheese, with it it was a very low point recipe! It was so so good! I share it with my groups facebook support group along with a link to your page! Thank you for the inspiration! I’ll be popping it on my blog as well along with a link to you too. Thanks ! I am so glad you like the recipe. Thanks for sharing your lovely feedback. What’s your blog? I would love to read it too! Have a great time on my blog. XOXO Carine. How long do the bases last? Can you refrigerate or freeze the bases? The base will get softer if you store this in the fridge, but it can be rewarmed really well in hot oven. Rewarm until crispy then add your favorite toppings. I won’t freeze it though. Enjoy the recipe. XOXO Carine. Recipe looks lovely though it does have eggs!I am going to follow all your suggestions to reduce the eggy taste for sure. But I couldn’t find baby spinach .Will normal spinach do? Love your blog .IMHO clean and beautifiul indeed. Sure normal spinach will work well! Make sure you use fresh spinach tho. Thanks SO much for following my blog and for this beautiful comment. It makes me very happy. XOXO Carine. HI! How much longer should the crust go back in the oven once the toppings are added? Won’t the crust get burned? Hi, Simply bring it back until cheese is melted, about 8 minutes, not more. 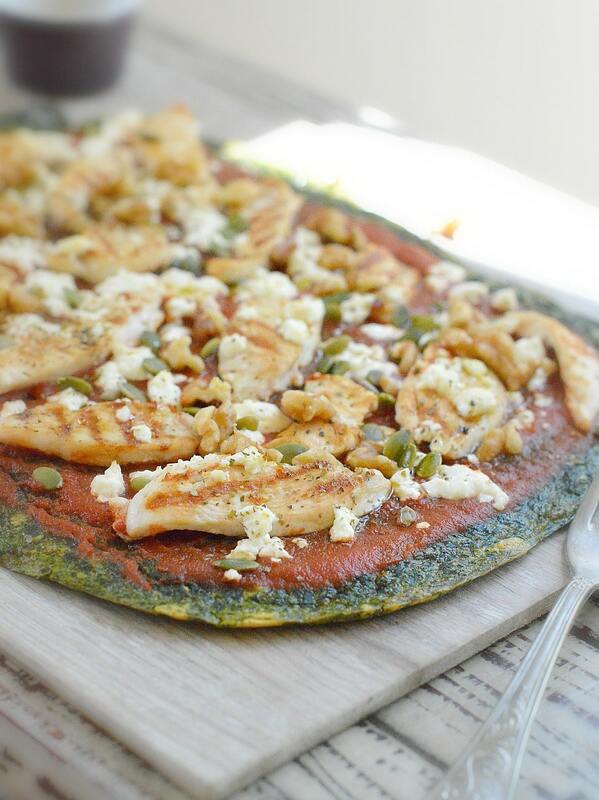 Enoy the pizza and all the low carb recipes on the blog. XOXO Carine. So does 4 slices equal 1 lean and green meal? Well this depends of your macros, 1 slice is 59kcal so yes I would say 4 slices makes a decent intake for a dinner. Enjoy the recipe, XOXO Carine.